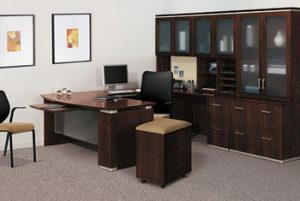 For an office furniture company serving Atlanta, Georgia, that provides affordable new and used office furnishings from the top-tier manufacturers in the trade, look no further than the trusted professionals at NorthPoint Office Furniture. Since first opening our doors in 1994, NorthPoint has provided both businesses and homeowners alike with budget-friendly furniture options in addition to exceptional customer-oriented service. Individualized customer service – At NorthPoint, we believe in providing every customer with an enjoyable yet informative shopping experience. Our furniture experts will take the time to understand your exact needs, deadlines, and financial constraints in order to develop a personalized solution for your office furniture necessities. Extensive inventory options – From traditional and contemporary designs to veneer and laminate options, NorthPoint’s massive selection of office furniture includes an array of desks, conference tables, workstations, numerous seating possibilities, and filing cabinets, among many others. First-rate pieces – To ensure our products’ dependability, comfort, and design, NorthPoint is proud to offer furnishings from the leading companies in the office furniture industry, such as DMI, Global, Humanscale, Office Source, HON, and Martin Furniture. Furthermore, NorthPoint’s conveniently located 8,000-square-foot showroom features fully staged displays of office furniture to help customers like yourself envision the pieces in your own workspace. If you’re unsure of what the best arrangement of furniture may be for your office, one of our knowledgeable specialists will gladly assist with the layout plan. To learn more about how NorthPoint Office Furniture has become the dependable company that Atlanta, GA, businesses and residents rely on for their furniture needs, contact us today.